In this chapter, we'll show you how to control Resolume with a MIDI controller. You can assign shortcuts for your MIDI controller in exactly the same way as you do for your keyboard. The only difference is you need to let Resolume know you've got a MIDI controller connected first. You do this via the MIDI tab of the Preferences. For now, all you need to do here is toggle on MIDI Input and MIDI Output for the device you want to use. That's it. We'll worry about the rest later. Tip! Not sure if your MIDI controller is working or not? 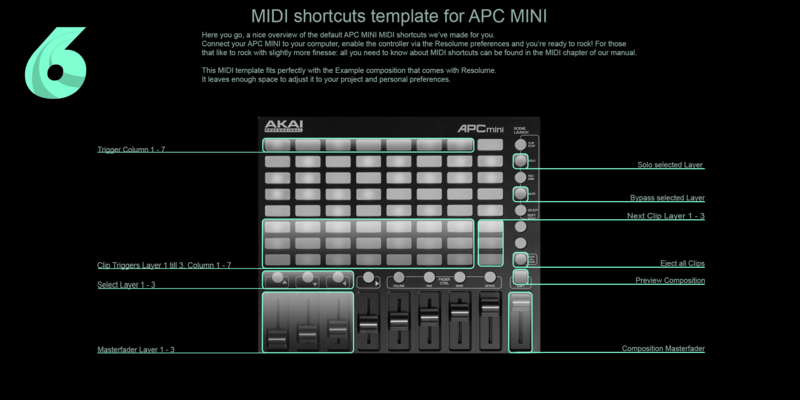 Fold out the MIDI monitor on the right of the MIDI Preferences. 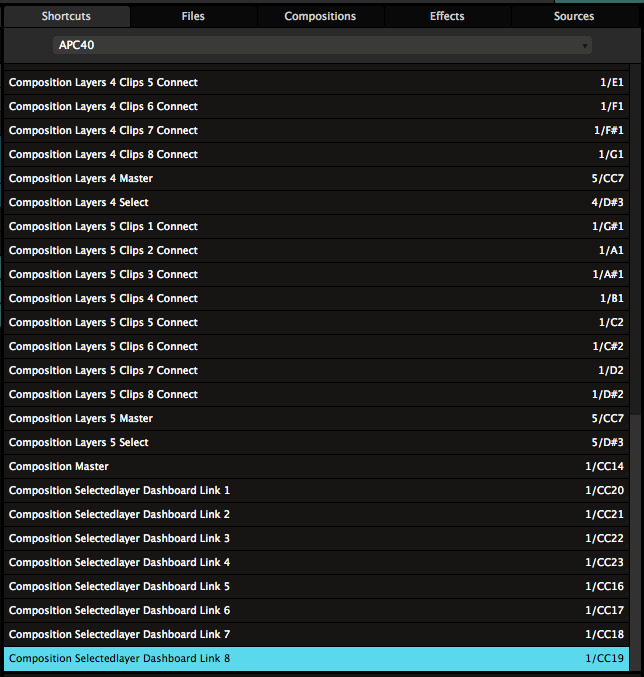 Resolume will show you all the MIDI messages it's receiving from all enabled controllers. If you're seeing messages come in here, but Resolume is not doing anything with them, something is wrong with your shortcut setup. If nothing is showing up here, something is wrong with your MIDI controller. Let's start with a simple shortcut. We want a shortcut for the blackout button. So when we use that shortcut, the whole output should go black. This is useful as a sort of panic button ("oh no, get it off mah screen! "), or to create tension before a big drop. You create shortcuts by opening the Shortcuts menu, and choosing which protocol you want to create a shortcut for. The interface will now change color. For MIDI shortcuts, we went with a nice pastelly cyan. Everything that has changed color can have a shortcut assigned to it. So find the Composition Bypass button in the top left of the interface and click on it with the mouse. Now press the control you want to use for this. I suggest to use a button that's easy to find on your controller. Ideally you can find it without looking down. Maybe something on the corners of your controller? Either way, press the button and voila, you've assigned your first shortcut! If the Bypass button was big enough, you could even read which shortcut was assigned to it. Press the Escape key to exit the Shortcut mode, and you can now bash your shortcut to toggle the Composition Bypass on and off. On and off. On and off. On and off. Okay. Stop. That's enough. You'll see a bunch of stuff about Channels, Notes and Midi Output. We can worry about that later. Right now, we're only interested in one option, namely "Piano". All buttons in Resolume can be set to Piano mode, which means that they will be on for as long as you hold the key or button down, and turn off when you release it again. Nerd alert! For some arcane reason, some controllers (like the NanoKontrol) will send CCs instead of Notes when you press a button. I won't bore you with the technical details and a long rant on how this makes no sense. If the shortcut for your button says CC instead of Note, and you don't see the Piano and Invert options, just change the Mode to Button and you'll be golden. Now go into Shortcuts mode, and assign a shortcut to the Opacity of the Invert RGB effect. Pick a button on your controller that makes sense to you. Instead of just toggling, a button can also be used to set a slider directly to a specific value. In the shortcuts panel, you can change the Mode from Toggle to Value. Don't worry, we'll cover Velocity as well. Be patient, young grasshopper. In Value mode, you can use your controller to set a slider to a specific value. So pressing the button will set the Opacity of the Invert RGB to 0.10, regardless of what it was set to before. This is great for resetting a parameter to a certain value. You will see that your shortcut is now used twice. By clicking one of them, it becomes selected and you can change it to whatever you like, just by pressing a different button. Tip! If you're not that big on blinding your audience with epileptic strobing, you can also think of things as using multiple shortcuts to set the Hue of a Colorize effect to specific values. This way, you can quickly match the color of the video to the color of the lights. Shortcut Groups are shortcuts applied to a group of Radio Buttons, or to a Dropdown. Not sure what Radio Buttons and Dropdowns are exactly? They're explained in detail, with examples, on the Parameter page. Shortcuts assigned to these type of control are special. A regular control usually has only two options, On or Off. These controls have a lot more. If you really want to get to the nitty gritty of shortcut control, try duplicating your shortcut, and then assigning it to a different item in a group. You can also assign MIDI CC shortcuts to a group. This will let you cycle through every option in the group. In most cases, this is not so very useful, but it can be fun to cycle through all the layer blends with a rotary. You can find a special Shortcut Group in front of the clip triggers. It's revealed when you enter MIDI shortcut mode. When you assign a shortcut to it, you can trigger all the clips in that layer with a single control. 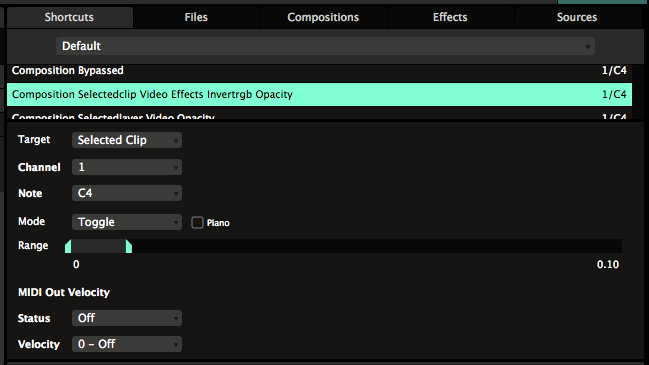 Assigning a MIDI CC will let you trigger clip 1 through 128 by sending different values on that same CC. When you're assigning shortcuts for use with a MIDI controller, you get access to a few special modes as well. Which modes are available depends on whether you're assigning a MIDI Note message or a MIDI Control Change (CC) message. Tip! Every MIDI Message allows you to change its Channel and CC or Note values. If you know what you're doing, you can use these to manually change the MIDI message associated with the shortcut. If you're just assigning shortcuts for your controller, you don't have to worry about this. MIDI Control Change sounds very impressive, but it's basically just used for sending values between 0 and 127 from a fader or rotary knob. When assigning a MIDI CC shortcut, your options are Absolute, Button, Relative and Fake Relative. Absolute is pretty straightforward. It just lets you control the range of the parameter with the range of your fader or rotary knob. This is the mode you'll want to use on most standard MIDI controllers. For instance, using Absolute mode, you can assign a MIDI fader to the Opacity of a layer. Pushing the fader up makes the layer fully visible. Pushing the fader down makes the layer invisible. Yes, I'm actually explaining this to you. I'm nothing if not thorough. If you want, you can Invert this behaviour, or set a specific Range. Button is a bit weird. 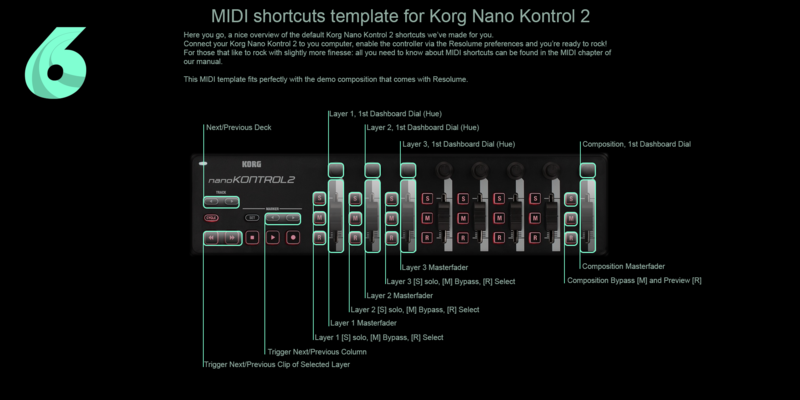 Some MIDI controllers, like for instance the Korg NanoKontrol series, can send out CCs when you press a button. This makes very little sense from a logical perspective, but I'm sure they have their reasons. Using Button mode, you can tell Resolume that this CC is actually being sent by a button. This way, Resolume no longer thinks you're moving a fader, and you get access to all the cool button specific modes like Toggle and Value. Some rotary knobs don't send out fixed values between 0 on their left side and 127 on their right side. Instead of coming to a stop on each end, you can twist them endlessly in both directions, and they will keep sending out different values. For instance, the APC40 MK1 has a relative rotary above the master fader. The MK2 even has two, the second one is placed on the top right next to the Tap button. This is very useful for setting parameters with a big range that you need to set precisely, like Position X or Y, adjusting the BPM. You can also do fun things like scratching the playhead with these type of knobs. If your controller has a rotary like this, you'll want to use Relative mode for it. In Relative mode, you can change the responsiveness of the rotary by changing the amount of Steps the rotary controls, or its Step Size for each turn of the knob. These controls are dependent on each other, so changing one will update the other. Basically, a higher Step Size will mean fewer Steps, and a bigger change in value when you turn the knob. A lower Step Size means more steps and a smaller change in value. Toggling on Loop will cause the parameter to loop back to the beginning when it reaches the end, so you can keep on spinning forever. Also, you can Invert the shortcut. Fake Relative is not some shady figure claiming to be your uncle at parties. Some controllers have rotary knobs that you can spin endlessly, but that aren't actually relative rotaries. Instead, they send out regular values between 0 at the far left and 127 on the far right and you're supposed to use them like a regular, Absolute rotary. The APC40 series has them on both the MK1 and MK2. Using Fake Relative, you can trick these rotaries into thinking that they're actual endless relative rotaries, and you can use all the options you have for the regular Relative mode. MIDI Notes are messages that turn something On or Off. Their usually sent by the buttons or pads of your MIDI controller. On some controllers, they can send 'velocity' values, based on how hard you press the button. Because MIDI Note are basically the same as your keyboard, you have the same options for Toggle, Piano, Range and Value. Between these, you can cover most bases. One special mode is Velocity. If your controllers supports this, you will send velocity values when you press the button. The harder you press, the higher the velocity will be. MIDI Clock is kind of an odd one out in this chapter. It's not really a shortcut, but more a means of syncing Resolume with other devices or applications. Because it's not a shortcut, you set it in the MIDI tab of the Preferences. The principle is simple. Let's say you're playing together with a musician, running Ableton Live. It makes sense that you both want to run at the same BPM. So when she starts playing faster, you follow along automatically. One way to do this is to use MIDI Clock. Your musician friend can enable MIDI Clock output in Ableton (it's called Sync there) and send this to you via a MIDI cable, virtual MIDI port or even via MIDI over a network. Resolume will then listen to this, and put your sets in sync. The MIDI Clock protocol consists of a few commands, most importantly Clock Tick, Clock Start and Clock Stop. When you first enable Clock Input for a device, Resolume will wait for the Clock Start signal. Most devices send this when you press play. It will then listen to each Clock Tick. These get sent on every beat by the master application. Resolume's BPM will follow along, as if you were tapping the beat by hand. All the time. Automatically. 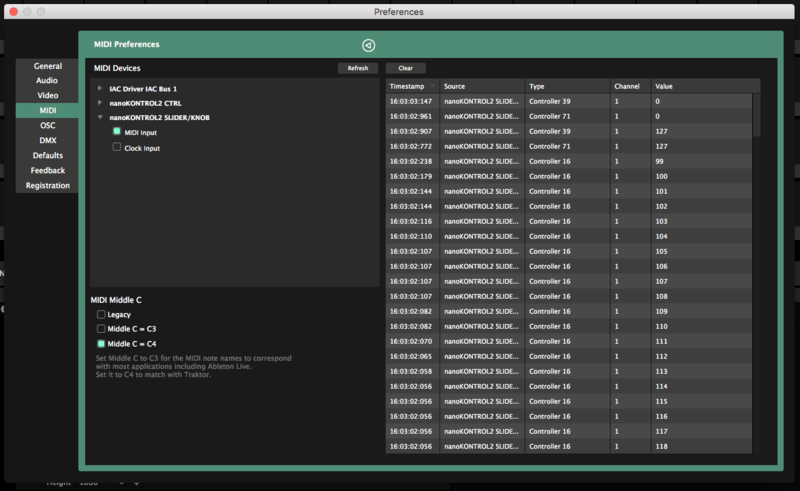 Via the dropdown, you can decide how Resolume reacts when it receives a Clock Stop. In 'Start/Stop' mode, Resolume will stop the BPM when the master stops. In 'Switch to Manual' mode, it will continue running, even when the master has told it to stop. Tip! MIDI Clock was great in 1996. It's notoriously wavy and not really accurate. Today, Ableton's Link protocol gives a much tighter sync, and is way easier to set up. Do you like pretty colors on your MIDI controller? Of course you do. So this is where the fun begins. A lot of modern MIDI controllers have colored pads. By changing the velocity value you send to the controller, you change the color of the pad. Tip! We have lookup tables for most controllers, so you can select the color of the pad by picking a color, instead of having to figure out what velocity is which color. On the APC40Mk2, we even have preview swatches! For a simple Toggle or Value shortcut, you can set which velocity to send for the Off and On states. For Clip Trigger shortcuts, the party really gets started. As it turns out, a clip in Resolume can have a whopping 5 states. So you can choose which color to send out for each state. Resolume ships with a few default shortcut layouts that we think are kind of useful. Of course you're free to modify it how you see fit, or completely ignore it. Resolume is freedom. 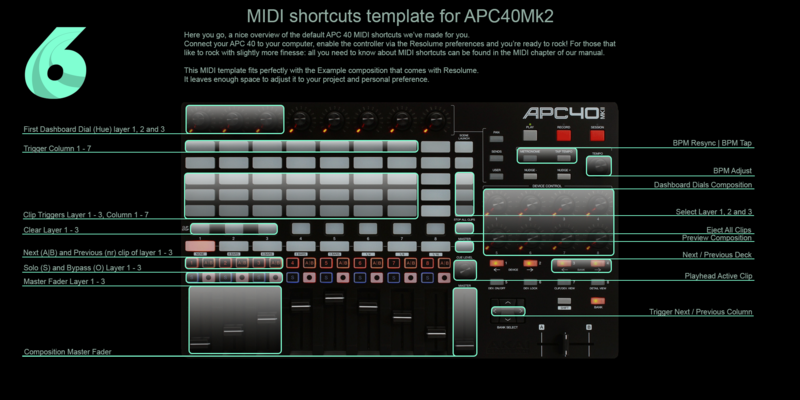 Peep the shortcuts for the APC40Mk2, the APC Mini and the NanoKontrol 2. Yo.